Kumoricon had its tenth anniversary this year, and like last year it was held in Washington, at the Vancouver Hilton and the Vancouver Red Lion on the Quay. I’ve noticed over the years that as the convention grows, so does the attendance for “Day 0,” the day before the convention officially starts. Years ago the convention itself felt fairly small, then attendance grew but Day 0 felt like a smaller more private occasion. 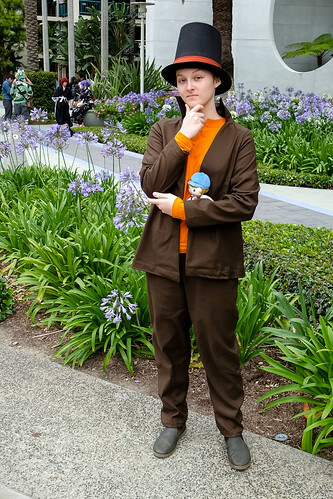 This year total attendance was 4,750 people, and so many cosplayers filled the park across from the Hilton on Day 0 that I definitely felt like the convention was already fully under way. At this rate, I suspect that a “Day -1” may eventually appear. 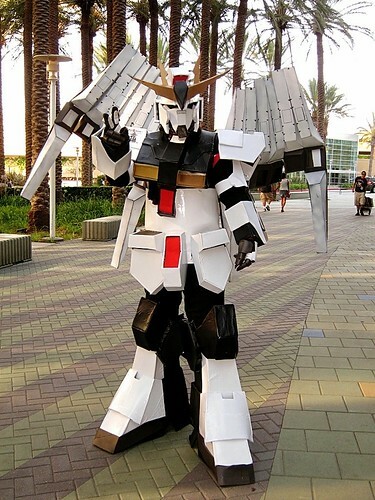 AM2‘s second year brought over 15,000 people to the Anaheim Convention Center to celebrate anime, manga, and music. 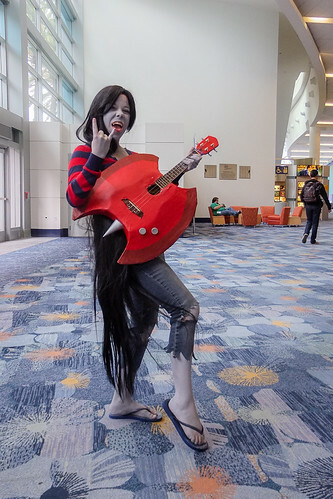 It felt a bit like “AM3” because in addition to Anime, Movies, and Music, the convention featured another great “M”: Movies. Screenings of the live action movies Kaiji 2 and Ace Attorney provided thrills and humor. Kaiji 2, a story about gambling, built up suspense and tension to levels that were almost too much. I’ve read the manga and I knew what was going to happen in the story, and still felt that way about it. 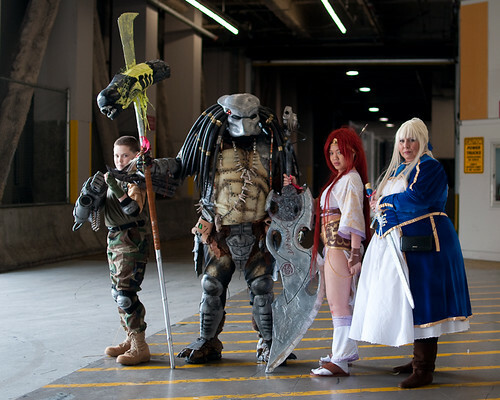 These are just a few of the cosplayers I saw at AM2 so far. Kumoricon moved to Vancouver, Washington and expanded to occupy two hotels: the Vancouver Hilton and the Vancouver Red Lion on the Quay. In contrast to the previous two years in downtown Portland, where the space sometimes felt cramped and inconvenient, the new location was a treat. Having a huge park with a farmers’ market directly across the street from the hotel gave people an obvious place to go for food, photo shoots, and relaxation. 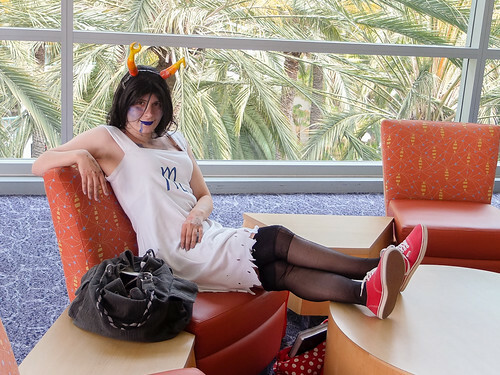 It made Kumoricon feel kind of like a temporary small town of its own, with about 4,000 attendees roaming the area. I’ve previously written about how much I like the VIZ Manga App for iPad. VIZ recently added support for the iPhone and iPod Touch. Once you have purchased the content on one device, you can download it on the other one without having to pay twice. This is a great feature that makes digital manga even more convenient. Though the reading experience is much better on the iPad because of the large screen size, at times I don’t have my iPad with me, and I appreciate being able to read the same manga on my iPhone. The app is free, and there are some free sample manga chapters to download for it, so it’s worth trying. 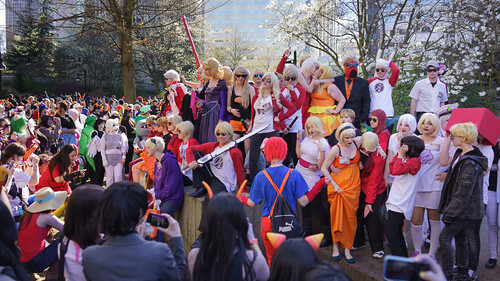 Sakura-Con drew 19,040 fans to the Seattle Convention Center to celebrate cosplay, anime, and Asian culture. Even though this topped last year’s total of around 18,000, the event seemed smoother than ever before. Pre-registration lines were much shorter, event lines were better organized, and getting around the convention center was easy. I’ve been doing the majority of my comic reading on the iPad lately. The iPad’s form factor and crisp backlit screen makes it a natural fit for comics. My favorite general-purpose comic reader is the comiXology reader for iPad. It features a large selection of free and paid comics available for in-app download, including titles from Marvel and DC, but it has a very small selection of manga. That’s where the VIZ Manga App comes in. This free app lets you download and read a selection of manga from VIZ, including titles like Dragon Ball, Vampire Knight, and Naruto. There are some previews available for free, so you can get a taste of how the app works without spending any money. And through the end of March 2011, all the “Volume 1” books are on sale for 99 cents each, which is a great deal. Right now the full price books are $4.99 each, which is still a good deal considering these are around 150-200 pages each. The actual content on this app looks great. When I read manga here, I feel like I’m basically seeing the same thing as in the paper version. The text is clear and legible even when it gets down to smaller sizes, and the app shows a whole page at a time, with no need to zoom in to read things (although zooming is supported). Swiping a finger across the screen scrolls to the next page without any noticeable delay. One somewhat odd feature in this app is that it keeps track of what page you’re on in a book, but if you switch to a different book and then back to the original one, it will lose your place in the original manga unless you had manually set a bookmark. This is not really a problem once you get used to it, but it surprised me because I assumed it would work more like the Kindle app, which keeps track of the current page in all the books separately. I like some of the quirky manga on the VIZ app, like Toriko, a story about a “gourmet hunter” who travels the world seeking the most delicious and exotic cooking ingredients. And my favorite manga so far on the app is Bakuman, which tells the story of two high school boys who are trying to break into the manga industry, one as an artist and the other as a writer. Bakuman is written by the creative team behind Death Note and has a similar visual style, but none of the supernatural elements of its predecessor. In fact, it reads more like non-fiction. It could have been subtitled “Behind the scenes at Shonen Jump.” The reader (along with the main characters) learns all about the business side of manga: everything from how stories are chosen for publication, to the intense competition between editors to find and develop hits. There’s a romantic subplot too, but the main appeal comes from the insider’s view of the manga industry. I recommend both the VIZ Manga App, and Bakuman as must-have content for it. 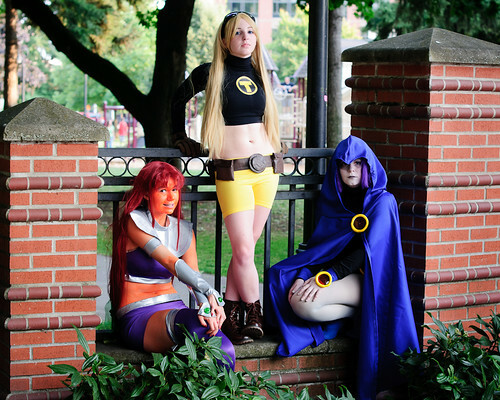 On Labor Day Weekend, downtown Portland came alive with colorful anime costumes, as Kumoricon occupied the Hilton Portland and Executive Tower for the second consecutive year. 4,055 people attended the convention, weekend badges were capped at 3,500 and sold out, and the charity auction raised $3,688 for the Portland Police Sunshine Division. 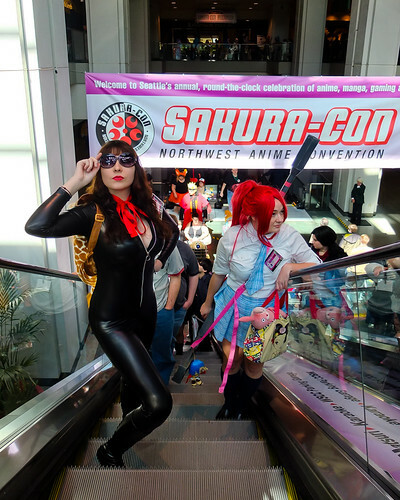 This year’s Sakura-Con was the largest ever, with an attendance of just over 18,000 people at the Seattle Convention Center. 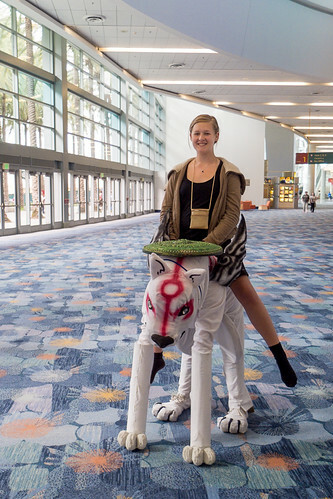 The convention provides an amazing variety of things to do, combining educational and cultural events with pure fun and entertainment. 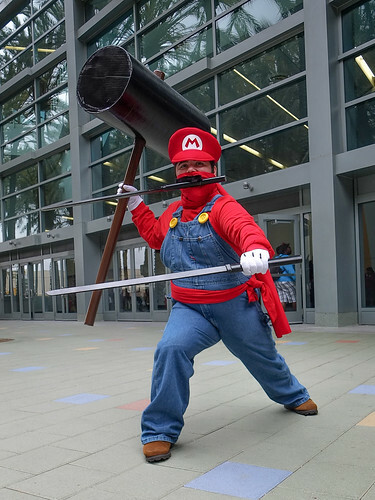 Fans can learn how to waltz or learn to dance ParaPara, learn to sew costumes or learn to draw comics, go to a martial arts demonstration or a video game tournament. 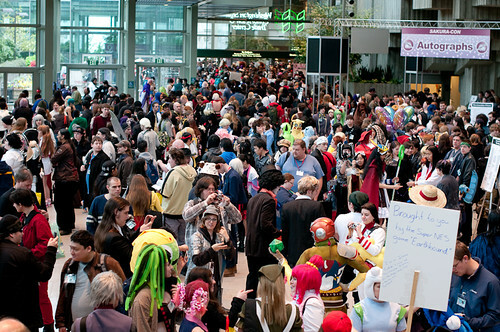 And just walking around between events is enjoyable in itself, because there are so many great costumes to see. You can also follow @jlhls on Twitter for my live convention coverage, or #sakuracon for a broader view. 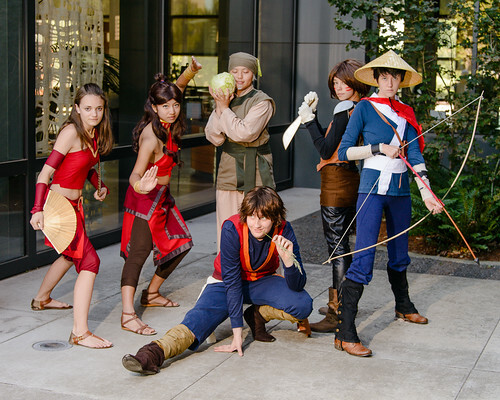 This year Kumoricon moved to a new location in the heart of downtown Portland, at the Hilton hotel on Sixth Avenue. The packed hotel lobby on Saturday convinced me of two things: that Kumoricon’s attendance was way up from last year, and that fans of Japanese animation were going to get a little taste of authentic Tokyo-subway-style crowding. Sometimes even getting from one part of the hotel to another was a challenge, especially when the journey involved elevators, but the fans stayed in good spirits. “What is it about an anime convention that allows you to hug people?” I asked. “It feels like we’re all one big family,” she said. The convention keeps growing, with this year’s member count at 16,586 — up from 13,600 last year — and a “turnstile” count of 45,560 for the weekend. Can 16,000 people really feel like a family? Yes, at Sakura-Con they can. The convention takes its name from the Japanese word for cherry blossoms, which fits well with the blossoming anime subculture. I never expected I’d have a good reason to use the phrase “cute zombie story,” but it fits Black Sun Silver Moon. Teenage boy Taki works as an assistant to Shikimi, a silver-eyed priest who also has silver hair, though he is only 28 years old. They have a typical comedic master/apprentice relationship, except for the fact that the work also involves late night zombie-slaying sessions in local cemeteries. The tone is more silly than scary, more like Chibi Vampire than Resident Evil.